Fleet Week San Francisco 2019: tips from a local. 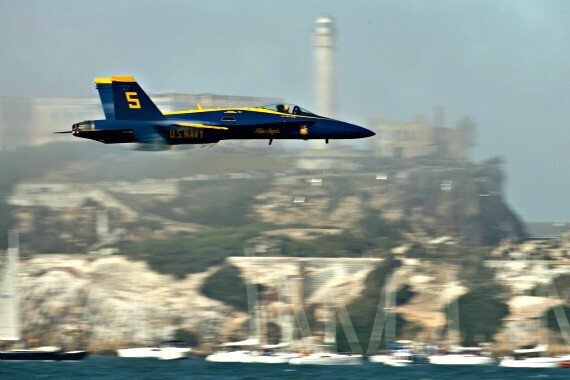 With the roar of the Blue Angels over the city, we know Fleet Week San Francisco is here! 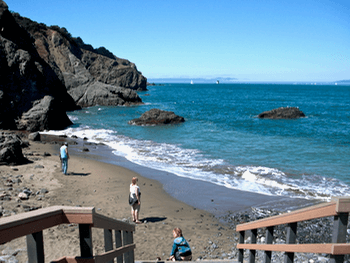 Here are some tips from a local on what to see and how to enjoy it with the least stress! The Blue Angels are performing October 11, 12 & 13 for the 2019 Fleet Week. Every year around Columbus Day in October, San Francisco hosts a series of events that celebrate our naval forces. See the Best Places to Watch the Blue Angels! 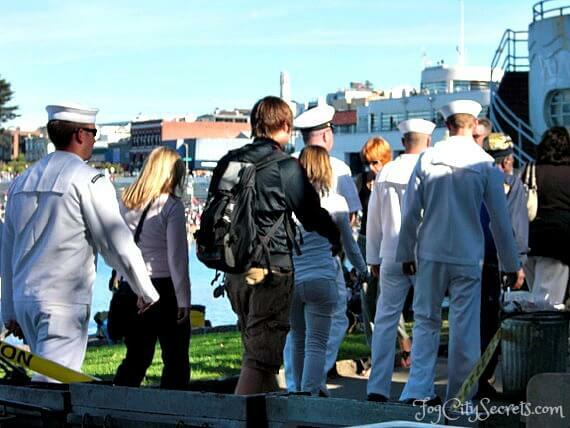 San Francisco's Fleet Week is enormously popular and draws huge crowds to the city's waterfront. 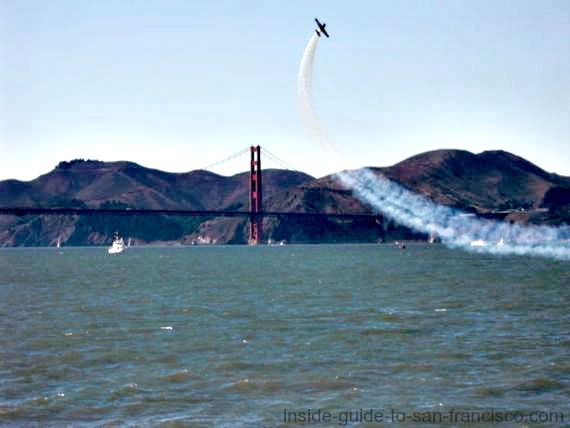 Friday, Saturday and Sunday, from 12:00 to 4:00 p.m., (October 11, 12 & 13 in 2019) an air show takes place on San Francisco Bay, visible all along the waterfront from the Ferry Building to the Golden Gate Bridge. A series of stunt planes swoop and loop above the water, warming the crowd up for the main event, the Blue Angels. The Patriot Jet Team joined SF's Fleet Week show two years ago, and we're lucky to have them back again this year. The Patriots are a locally-based group of pilots who do extreme maneuvers as a group of six jets, in the L-39C Albatross, a light-attack fighter jet often used to train fighter pilots. Most of these guys are former fighter pilots, and one is a former Blue Angels pilot. They perform all over the country, but have a home airfield in Byron, California, about an hour and a half from SF. 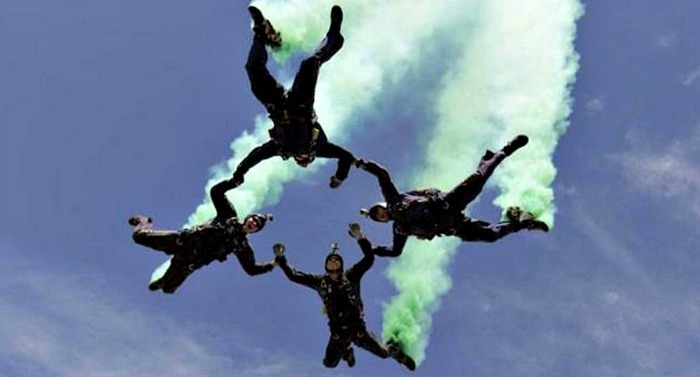 A team of active duty Navy Seals will be doing parachute jumps. At 3:00 p.m. each day, the Blue Angels roar in over the Golden Gate Bridge; such a cool sight! 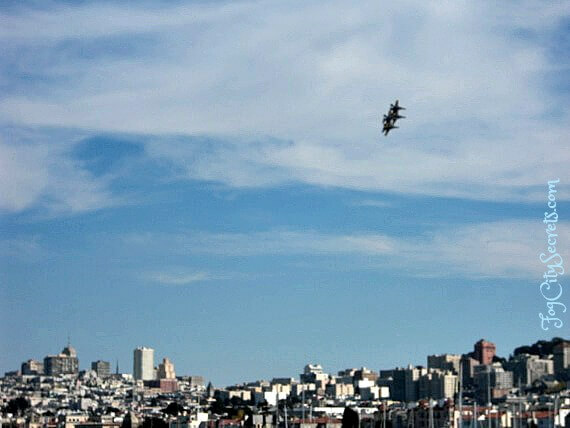 Six navy fighter planes perform frighteningly daring stunts over San Francisco Bay. Precision flying at its most breathtaking. Don't miss this! This is what most of the crowds have come to see. The Blue Angels fly from 3-4 p.m. Friday, Saturday and Sunday, and usually on Thursday as well (a practice day). For lots more information on the Blue Angels, including the best places to watch the show, see the Blue Angels San Francisco. When: the Friday of Fleet Week, October 11, 2019, from 11:45 a.m. to 12:45 p.m.
A variety of U. S. Navy (and one Canadian Navy) ships sail under the Golden Gate Bridge into San Francisco Bay, usually including destroyers, missile cruisers and amphibious assault transports. The "parade" lasts for about one to two hours; you can watch it from anywhere along the waterfront, though try to be where you can see them come under the bridge. It's such a great setting to watch the ships come in. Current 2019 ship tour schedule. 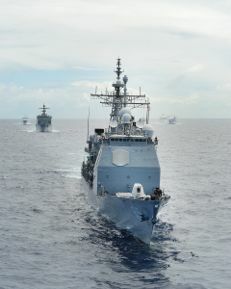 They don't usually announce the names of the ships, or where they'll be docked, until the week before Fleet Week begins. I'll post the information when it becomes available. Some of the big Navy vessels will be open to the public Wednesday, Thursday, Saturday, Sunday and Monday of Fleet Week, October 9 through 14, 2019. All the ship tours are free. If you've ever been curious about what it's like to be on a war ship, this is your chance to explore some of them. 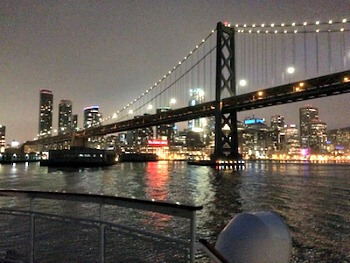 They will be moored at some of the piers along the San Francisco waterfront. In 2018, the tours were held at Piers 15/17, 30/32, 35 and 50. Five different ships were available for exploring last year. This is likely going to be the set-up for 2019 as well, or something similar. 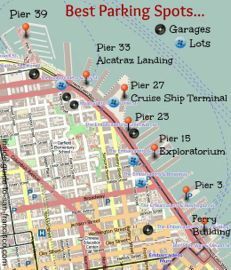 Piers 15/17 and Pier 35 are walking distance from Fisherman's Wharf; Piers 30/32 and 50 are not. Piers 30/32 are about a six block walk along the waterfront from the Ferry Building. Tip: get there early. The lines can be long, hours long at times. Also, there's no shade while waiting, so plan accordingly. To see photos of the ships for 2018, read a little about each one, and see a map showing where they will be on the piers, see Fleet Week ship tours. Plus tips on where to park and the open-house schedule. It's really cool to see the actual pilots up close. If you're willing to hang around Fisherman's Wharf until evening on Saturday, the pilots are usually signing autographs at the entrance to Pier 39, from 6:15 to 6:45 p.m.. Have an early dinner at the wharf, then see them in person. In the past, the wait hasn't been very long. 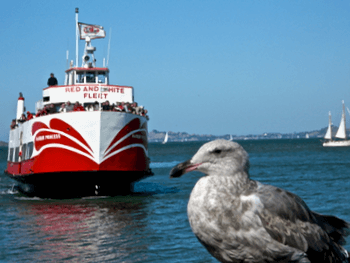 The Red and White Fleet offers a bay cruise to watch the Blue Angels show from the water. The view from the ship is excellent and the scenery is spectacular. They keep the boat in one spot for the show, a little ways offshore and directly across from Alcatraz so you can see the planes easily with no obstructions. 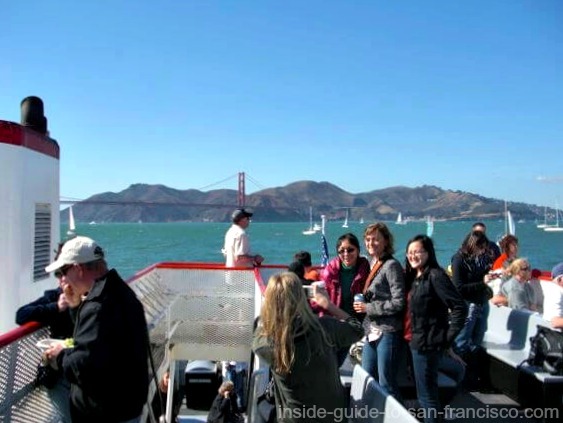 This is a two and a half hour cruise that leaves from Pier 43 1/2 at Fisherman's Wharf at 1:30 pm, and return at 4 pm, on October 11, 12 and 13, 2019. The tickets are a bit expensive at $90 (kids 5-17 $68), but you can sometimes get them half price through www.goldstar.com. Your ticket includes a nice buffet of salads, sandwiches and fruit. See my photos of the ship buffet. This year (2019) they've added one free drink (including wine and beer), plus there's a bar on board for purchasing additional beer, wine and soft drinks. There were a lot of people on board, but it didn't feel crowded. Highly recommended! I got 50% off my tickets from goldstar.com when I went. Check with them first, at Goldstar. It's free to sign up, then see what they've got. To book tickets directly with the Red and White Fleet, see Fleet Week Cruise. The Blue and Gold Fleet usually has a two hour Blue Angels cruise during Fleet Week, $98 ($60 kids) in 2018, including buffet lunch and open bar. Saturday & Sunday, 2-4 pm, leaving from Pier 39. www.blueandgoldfleet.com. They'll have two boats going out for each cruise time. See the air show from a sailboat. 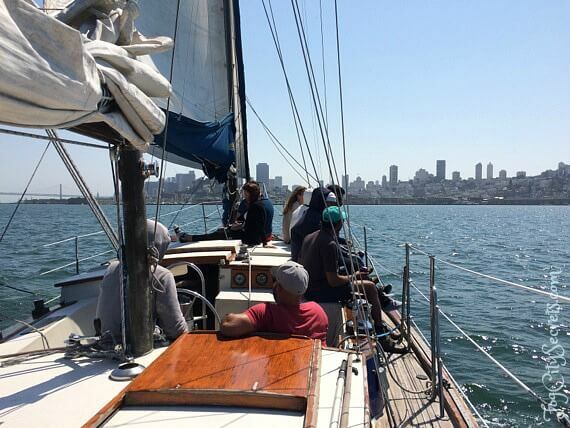 The San Francisco Sailing Company has Fleet Week cruises set up for the Thursday through Sunday air shows on their sailboats. $60-$100. Check out their availability at SF Sailing Co. I went on one of their 90-minute bay cruises and had a great time. For what their regular sailboat cruise is like, and pictures of the boat, see my page on it. 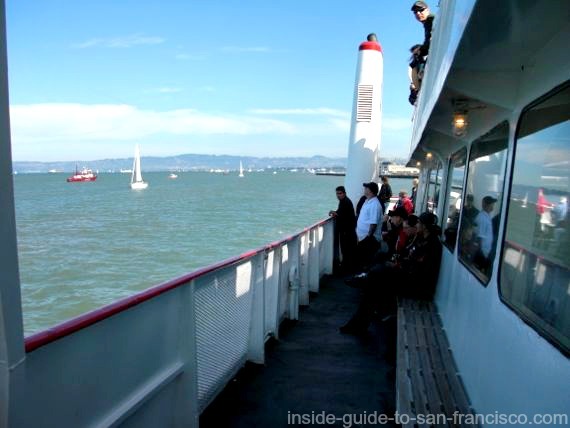 Another way to get out on the water to see the Blue Angels, a bit more expensive at $106, but rather elegant, is the Air Show Lunch Cruise on the San Francisco Belle, one of ships in the Hornblower fleet. The Belle is a charming recreation of an old-time, Mississippi riverboat, complete with paddle wheel and three levels of decks. The champagne flows freely and you are treated to a more extensive buffet with salads, entrees and desserts, during the two hour voyage. This cruise goes out at 2:30 p.m. on Friday of Fleet Week, from Pier 3 (Hornblower Landing) close to the Ferry Building, for the Friday "practice" air show including the Blue Angels (which is just like the regular shows on Saturday and Sunday). $103 per person. The Saturday and Sunday Blue Angels lunch cruises are $106 per person. They also have a 3-hour Premier Fleet Week Cruise with buffet lunch, free booze and live jazz for $132, leaving at 2:00 pm Sunday. See premier cruise. If you're up for a longer cruise on a historic war ship, you might consider the USS Jeremiah O'Brien, one of the few remaining liberty ships used to transport troops during WW2. They have Fleet Week cruises on Saturday and Sunday, October 11 & 12, 2019, from 10 to 5 (boarding at 9), that sail around the bay, under the Bay Bridge, and give you a great view of the air show. $150 adults, $90 kids 5-16. See Jeremiah O'Brien for details. Food, drinks and music included. It's an interesting ship to explore (the Titanic's boiler-room scene was filmed on it). This is the same ship that's normally parked at Pier 45 on Fisherman's Wharf and available for a visit year-round. Tip: the Fleet Week cruises are very popular and tend to sell out, so it's good to book early if you plan on going. During Fleet Week there are Marine and Navy Band concerts at various locations around the city, plus lots of other things (see a complete list of events at Fleet Week schedule). There's a band concert in Golden Gate Park on Monday of Fleet Week, October 14, from 10 to 3. The US Marine Corps Band performs, then there's a competition among local high school bands. It's on the Music Concourse, at the bandshell, between the Academy of Sciences and the de Young Museum. A long-time, San Francisco tradition, the Italian Heritage Parade, formerly known as the Columbus Day Parade, starts at 12:30 p.m. on Sunday, October 13, 2019, at Jefferson and Powell Streets, goes along Jefferson Street in Fisherman's Wharf, then down Columbus Avenue to Washington Square in North Beach (see parade). There is also a festival at the Marina Green, with food, information booths, etc, from 10 to 5, Friday, Saturday and Sunday, including exhibits about disaster preparedness. Pier 39 has some Fleet Week activities, as well. Check out Pier 39 for scheduled activities. Around 1 million people come to watch the Blue Angels. The sheer size of the crowds for Fleet Week in San Francisco is pretty scary, so a hefty dose of patience is required for taking Bart or Muni. Get off Bart (or Muni) at Embarcadero station, then go upstairs to Market Street where you can catch the F-line trolley in the direction of the Ferry Building. 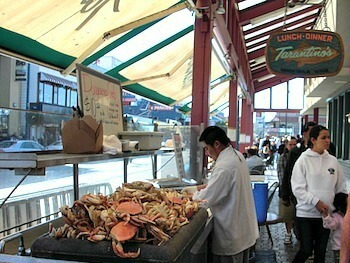 Or walk to Fisherman's Wharf, about 35 minutes along the Embarcadero. The F-Line Trolley runs along the Embarcadero (the street along the waterfront where all the piers are) to Pier 39 and Fisherman's Wharf. You can use your Muni (but not BART) transfer for the trolley. Muni buses and streetcars are now $2.75 for adults, $1.35 for seniors 65+ and youth 5-18. 0-4 yrs, free. Exact change required (or use MuniMobile app on mobile phone to pay). If you're going to the Navy ship open houses, get off at the pier(s) listed on the ship tours schedule (see info on ship tours and map). 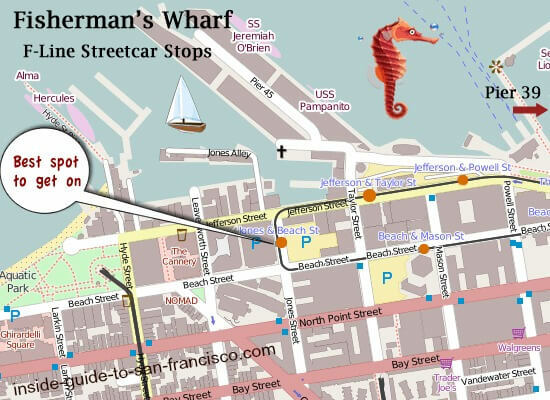 Piers 30/32 are not on the F-line; they are about six blocks south of the Ferry Building on the Embarcadero. For the Blue Angels show, get off at Fisherman's Wharf (the end of the F-line). Driving to Fleet Week in San Francisco sounds like something only an insane person would do, but it's surprisingly easy! At least where parking is concerned. There are a number of parking areas among the piers along the Embarcadero, within walking distance to Fisherman's Wharf; see my page on Embarcadero parking for maps and details. 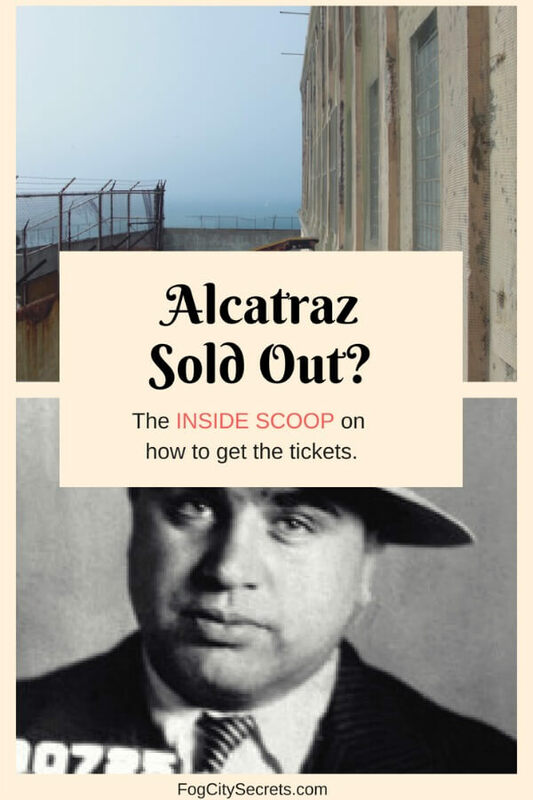 The catch is that it can be double the usual price for special events like Fleet Week. Pier 23 is about a 15 minute walk to Fisherman's Wharf. Something you may want to consider is reserving a parking space using the Spot Hero parking app. You can compare the parking garages and lots in the area and book one that works for you ahead of time. Drive or take public transportation...? I've done it both ways during Fleet Week, and driving and parking at the piers was vastly less stressful and frustrating than waiting in the long lines for the trains and trolleys, and being packed in with the crowds. I live in the city, but if you're coming over the Bay Bridge, the traffic might be as bad as the crowds on Bart! If you hit the evening rush hour on Bart or Muni, or a Giants game, or both like I did, you have my sympathy! It's a trade-off: expense vs. inconvenience. But it's all worth it to see the Blue Angels come roaring in over the Golden Gate Bridge! When to Go. Get there at least a couple of hours before the Blue Angels show starts (usually around 3 p.m.) to avoid the worst of the crowds and to get a good (free) viewing spot. See Blue Angels San Francisco for more info on the best place to watch from. The Blue Angels rehearsal on Thursday is usually the same show, but it's less crowded. Park at Pier 23 or 27. Much less stressful. Expensive, but makes the whole experience more enjoyable. See the Pilots. Hang around until evening on Saturday and see the Blue Angels pilots up close at the autograph-signing at the entrance to Pier 39, from 6:15 to 6:45 p.m.
Where to Catch the Trolley. 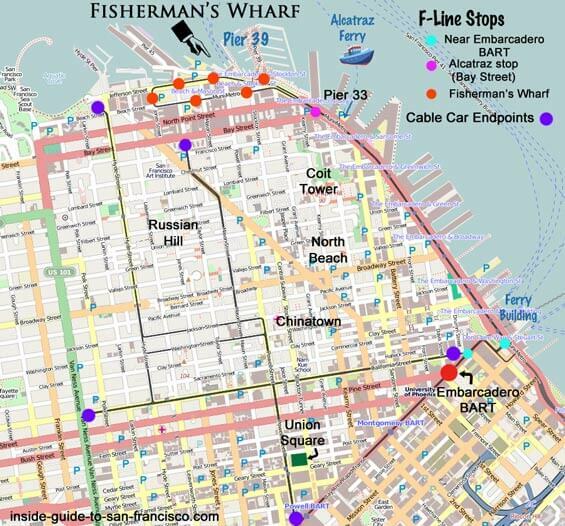 Get on the F-line trolley at either the first or last stops along the Embarcadero: at the end of Market Street at Main Street, above ground from the Embarcadero BART station, and at Jones Street between Jefferson and Beach Streets at the Fisherman's Wharf (marked on map below). Don't try to board at other stops; the trolley is usually packed and you may not be able to get on. If the crowds are bad at the Embarcadero stop on Market Street, hike back to the previous stop on Market (at 1st Street). 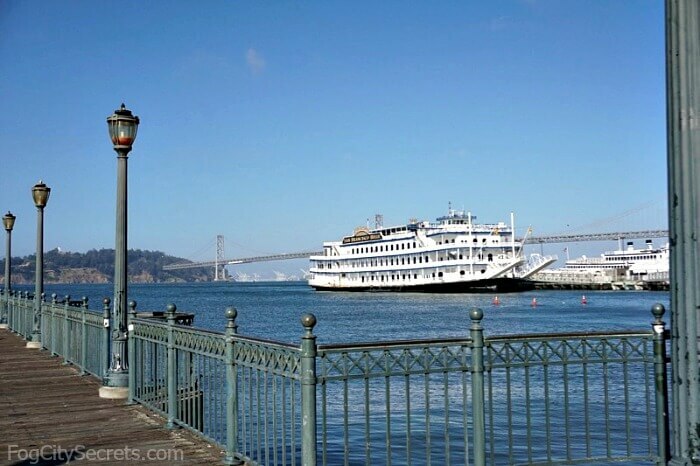 Walking is a great alternative: 25 to 30 minutes from the Ferry Building to Fisherman's Wharf. Or a take water taxi from Pier 1 1/2 (next to the Ferry Building), or a pedicab. 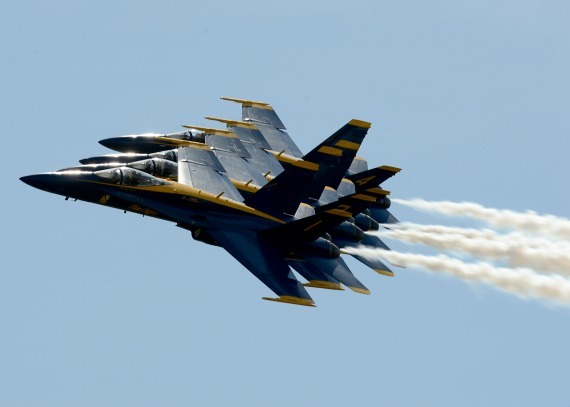 If you are coming for the Friday Blue Angels show, know that the SF rush hour starts around 3:30 p.m.; commuters leaving the downtown area and locals leaving town for the weekend jam the routes to the bridges and freeways, and BART and Muni can be packed leaving the city. Thursday rush hour is almost as bad. For the sake of your sanity, I suggest having dinner in the city and leaving after 7:00 p.m.
For detailed maps and info about parking along the Embarcadero, see Embarcadero parking. For more information on the ship open houses and the Parade of Ships, see ship tours. For more info on the Blue Angels... their history, training, air show, and best viewing spots, see Blue Angels.